There’s plenty of talk of new motorhome models and interesting, but not necessarily fully proven, concepts for the season ahead – so, what better time to revisit a tried-and-trusted best seller? 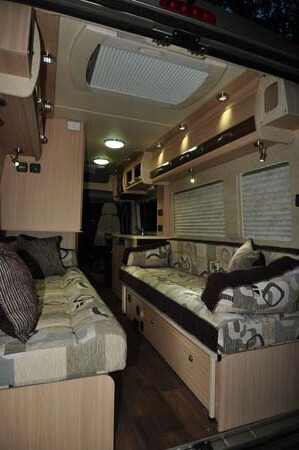 Introduced for the 2009 season, the Auto-Sleeper Warwick (now also dubbed Duo) has emerged as Auto-Sleepers’ most popular high-top motorhome model, topping the sales charts last year even as the company seriously upped its van conversion offerings. 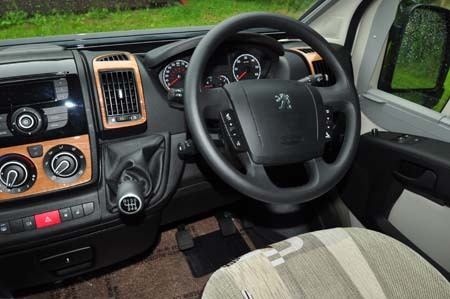 It’s a strictly two-berth conversion of Peugeot’s long-wheelbase Boxer, but luxury is very much to the fore here in a layout that has twin settees at the back and a rather extensive kitchen along the offside. That kitchen is indeed something to boast about. 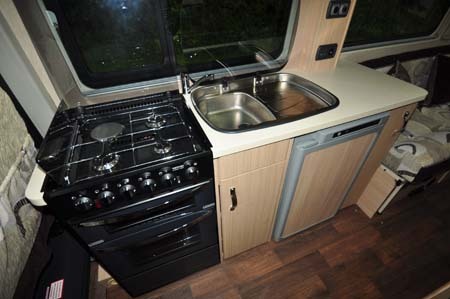 Not only does it have more than its fair share of equipment – full Thetford Caprice cooker plus microwave, extractor unit, sink with drainer, 77-litre fridge with freezer compartment – there’s also a relatively generous amount of worktop space. Storage isn’t exactly lacking, either. Directly opposite, and despite inching quite a way across the sliding door aperture, the washroom is compact rather than capacious. It’s also rather traditional. There’s a bench toilet here, and a flip-down sink. Storage is minimal, too, and there’s just a curtain for showering. 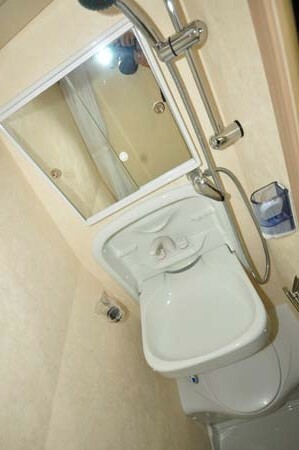 Also lacking is a window, although it’s hard to see how one could be onforporated given the washroom’s location. When it comes to sleeping, the beds aren’t the longest, either – both singles are 1.85m (that’s 6ft 1in) x 0.68m, while the double is a slightly more accommodating 1.87m x 1.85m. They’re on reflex foam, too, which tends to be firm (and stays that way). As for choice of upholstery – here it’s Berry, complementing the gold metallic exterior, itself one of a choice of four paint finishes (all metallic, except for the white) as well as features such as alloy wheels, wind-out awning, day-running LED lights etc. It also rides that bit better than its rivals, thanks to features such as the Al-Ko AirTop suspension aid and extra leaf springs at the back, with Peugeot’s 130bhp engine and six-speed manual gearbox as standard. Other highly sensible feature is the underfloor gas tank, in lieu of a locker housing cylinders. Not only will your gas be a whole lot cheaper, it also helps free up interior storage space. 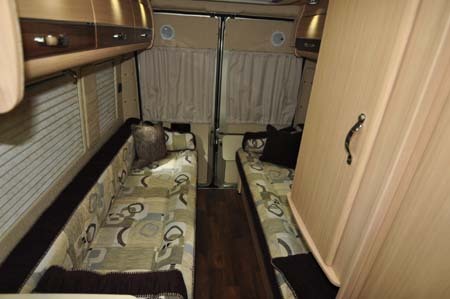 As well as room on both seat bases (admittedly, the Truma Combi boiler is housed in the offside), which easily hinge up for access, there’s also a good amount of upper-level locker space, plus various material pockets throughout, plus a half-depth wardrobe (hanging over the nearside settee). Nevertheless, the whole still seems short on overall luggage space. As reviewed, this Warwick Duo has Auto-Sleepers’ Premium Pack, which includes many of the features mentioned above. 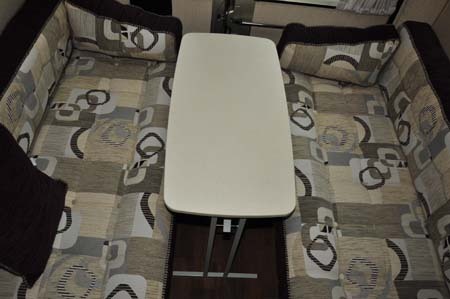 It’s worth it, and the truth is you’ll struggle to get any Auto-Sleeper without it, such is its popularity. Think the layout’s not flexible enough for you? Ask Auto-Sleepers about the facility it’s trialling wherever the rear offside settee can be converted to a single dinette – it looks really clever! The Duo also faces competition from its own stable, in the face of the longer, 6.36m XL Warwick variant. Interestingly, here, Auto-Sleepers has swapped the locations of the kitchen and washroom, which helps open up the whole interior. It makes you wonder – maybe this time next year we’ll be talking about a new Auto-Sleeper best seller. 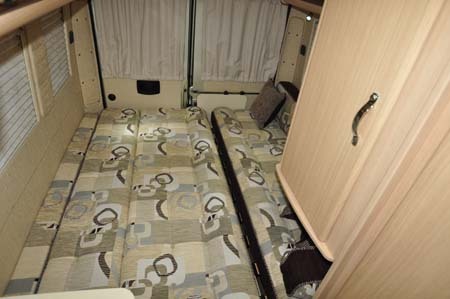 There’s more information on the Kingham on the Auto-Sleepers website and to find out more about our low-cost premiums visit the motorhome insurance discounts page. Cracking piece of kit I’ll admit. But would Auto-Sleeper build one like this on a vehicle provided by the customer? I only ask as I’m looking and looking for something around the six metre length, maybe a touch longer on a base vehicle of my choice. 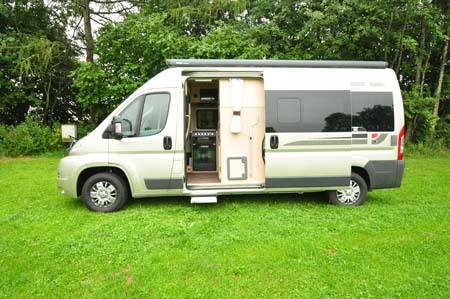 I’ve been a fan and owner of Mercedes based motorhomes, i.e. a SCSporthome, a Rimor and best of all in my humble opinion a Eura-Mobil. As I’m disabled I have to have a base vehicle which has a fully automatic gearbox. I have access to any number of used one owner Mercedes MWB 2010 vans that are fitted with the automatic gearbox. At present we have a 2008 ’08’ Volkswagen Auto-Sleeper Sandhurst which although very good is due for replacement and so I thought as my next motorhome is probably the last one I purchase (due to my ever increasing number of birthdays) it would be a good idea to try and get something as good as the Auto-Sleeper again but on a Mercedes base. David……boiling in Cervera del Maestre..34c this morning!!! Phew. Great to hear from you – it sounds like a longer base vehicle would make your life much easier! We’ll pass your query on to Auto-Sleepers and see what they have to say on the matter.